Bob Dylan Makes Rare TV Appearance: Pawn Stars? From Variety magazine we just learned that the rights to one of Bob Dylan’s finest albums, Blood on the Tracks, has been acquired by a Brazilian film company to be adapted into an English-language feature film. 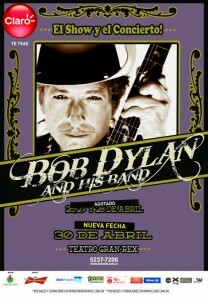 Coincidentally (or not), Dylan is currently on tour in Brazil. For our South American readers (or Norte Americanos heading there soon), check tour dates HERE. Brazil-based RT Features is moving on a simple twist of film, acquiring rights to adapt Bob Dylan’s 1975 album “Blood on the Tracks” into an English-language feature. RT Features toppers Rodrigo Teixeira and Fernando Loureiro will produce and are seeking a director after buying rights from Grey Water Park Prods. that include the ability to use the music in the film. “Blood on the Tracks,” Dylan’s 15th studio album, contains “Tangled Up in Blue,” “Simple Twist of Fate,” and “Shelter from the Storm” and is ranked by Rolling Stone as the 16th greatest album of all time. Dylan biographers have concluded the songs stemmed from personal turmoil at the time, including his separation from his first wife. But Dylan said in his memoir “Chronicles, Vol. 1” that the songs were inspired by Anton Chekhov’s short stories. As part of their plan to move into developing and producing English-language films, RT Features has partnered on developing crime novel “Strip” into a feature with Thunder Road Pictures and “The Games of 1940,” a co-production with Kennedy/Marshall that will be written by David Seidler and Luca Manzi. RT Features has produced Portuguese-language films including “Romeo and Juliet Get Married” and “Drained,” selected for official competition at Sundance. The company’s “Heleno” and “The Silver Cliff” played at last year’s Toronto Film Festival while “O Abismo Prateado” was part of the Cannes Directors’ Fortnight screening selection.